Dr. Oscar E. Biscet, President of the Lawton Foundation for Human Rights, was released October 31, 2002, after serving a three-year sentence at a maximum-security prison for his peaceful defense of human rights. Thirty-six days later he was violently re-arrested in Havana and forced in a cell with common criminals as he was to join a group of civilians to discuss human rights. He remained in prison and was included in a crackdown by the Cuban regime in March-April, 2003, against 75 independent journalists, librarians, and human rights advocates who went before summary trials and were sentenced to prison terms of up to 28 years. Since 1998, this physician has been suffering physical and mental torture in different penitentiaries for refusing to carry out any disciplinary prison measures he deems unacceptable as a political prisoner of conscience. He is presently serving a 25-year sentence at the Combinado del Este, maximum security Prison in Havana. Dr. Biscet is an example of the human rights violations suffered by all those in Cuba who dare to defend the Universal Declaration of Human Rights. 1. Born of humble origin on July 20, 1961, Dr. Biscet is a Cuban physician of the black race, follower of Mahatma Ghandi and Martin Luther King. He is a leader in the peaceful civil rights movement, who struggles to establish in Cuba a state based on the rule of law through nonviolent civil disobedience. He is president of the Lawton Foundation for Human Rights, an organization established in 1997, considered illegal by Cuban authorities. 2. Dr. Biscet is forbidden from practicing his profession in his own country. He was expelled from the Cuban National Health System in 1998, for documenting abortion techniques and peacefully denouncing them before his medical colleagues and Cuban authorities as a form of genocide in a study called: RIVANOL: A METHOD TO DESTROY LIFE. 3. Dr. Biscet was evicted from his home in 1998 with his wife and son, having to depend on the charity of friends to survive. His wife presently lives at the home of a former patient who took the family in. 4. Elsa Morejón, Dr. Biscet’s wife and a nurse by profession, has been unemployed since 1998 as a result of her husband’s human rights activities. Elsa was publicly attacked by the government-controlled mass media at her husband’s trial in 1999. She is constantly watched, has received threatening and obscene phone calls at home, and Cuban authorities have demanded she pay unjustified fines for penalties never committed. 5. Cuban State Security has mistreated Dr. Biscet physically through beatings. 6. Cuban State Security has tried to confine Dr. Biscet to a psychiatric hospital and has tortured him psychologically through systematic and arbitrary confinements, threats, humiliations, blackmails, and intimidating interrogations. 7. Cuban authorities have pressured Dr. Biscet to leave Cuba. He has reiterated that he will never abandon his country. 8. Dr. Biscet was arbitrarily incarcerated 26 times in 16 months from July 9, 1998 until November 3rd, 1999 in cells with no sunlight and with insane individuals and common criminals. When most of these detentions occurred, his family was not informed of his whereabouts. 9. Dr. Biscet went on trial on February 25, 2000, for announcing a peaceful march along with a number of human rights advocates, on the occasion of the 1999 Ibero-American Summit in Havana, at a press conference where two Cuban flags were displayed in an inverted vertical position as a sign of protest for the human rights violations in Cuba. Dr. Biscet was accused of “dishonoring national symbols”, “public disorder”, and “inciting delinquent behavior”, and was sentenced to three years in prison. He was subsequently transferred 450 miles East of Havana away from his family to “ Cuba Si “, a maximum security prison in Holguín province. 10. At “Cuba Si”, prison authorities punished Dr. Biscet during 42 days for carrying out a fast, asking freedom for all political prisoners and human rights for Cuba. He described his isolation cell to his family as a torture; dark, and with no running water. He was fed such a deficient diet that he lost 20 pounds and several teeth. He was denied access to his Bible, medical attention, and family visits. 11. At “Cuba Si” prison authorities placed a paranoid schizophrenic inmate to share Dr. Biscet’s bunk bed on April, 2001. 12. During his three-year confinement in “Cuba Si”, his Bible was taken away four times and in spite of numerous official requests made by his family to receive spiritual assistance in prison, the Catholic Church was allowed to visit him only twice. 13. Dr. Biscet served his 3-year sentence at “Cuba Si”, and was released October 31, 2002, only to be re-arrested on December 6, 2002 as he was to meet with human rights activists, promoting a project called “Clubs of Friends of Human Rights”. 14. 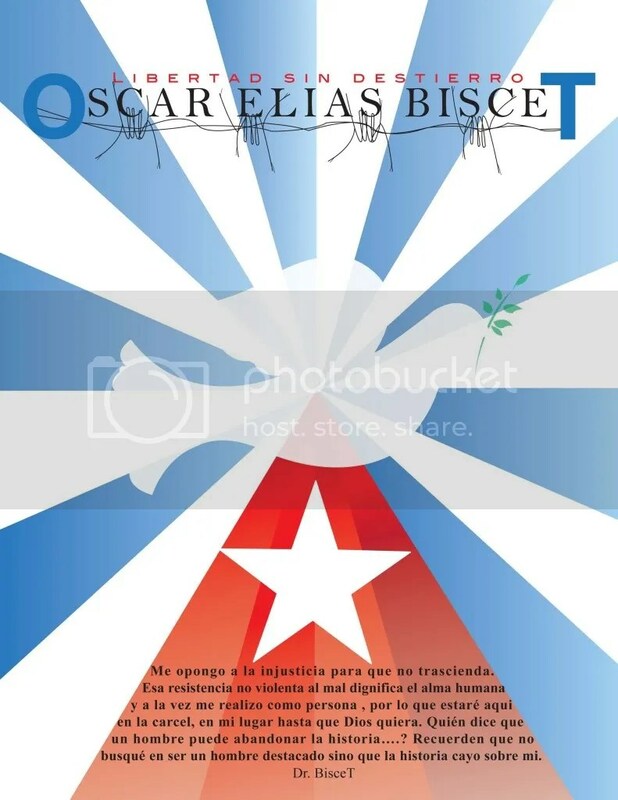 On April 7, 2003 Dr. Biscet went before a summary trial during a Cuban government crackdown along with 75 other activists, and was sentenced to 25 years for “serving as a mercenary to a foreign state.” He was transferred to the prison of Kilo 8 in Pinar del Rio where he was confined from November 13, 2003 through January 15, 2004 to an underground dungeon with a common criminal where he lost 40 pounds. c. He’s been prevented from writing to his family, and his mail has been and is intercepted, read, and confiscated. d. He’s been prohibited from receiving or making phone calls and most calls allowed are intercepted. e. His life and his health are in danger due to the repressive environment of the maximum-security penitentiaries he’s been confined to, exposed to dangerous convicts, insane individuals and in isolation cells 3 ft. by 6 ft. with no windows, no light, or running water. These humid whitewashed cells are void of any furniture or toilet facilities. f. He highly distrusts the military medical personnel at the prison facilities, reason why he has refused to receive any medical attention. Though, physically deteriorated, Dr. Biscet is very strong spiritually. 17. Dr. Biscet has been honored numerous times for his pro democracy struggle. On February 5, 2003, he received in the U.S. the first International Republican Institute Democracy’s People Award; on November 5, 2007, he was one of the recipients of the Presidential Medal of Freedom, the highest civil award in the U.S., and he was also, honored in Germany with the “Dr. Rainer Hildebrandt Medal 2007” on December 12, 2007. In like manner, the Czech Embassy in Washington D.C. paid homage to Dr. Biscet’ on February 27, 2008. 18. Dr. Biscet is one of several Cuban political prisoners who will only accept an unconditional release from prison and would never go into forced exile. More than 50 ex-political prisoners were released and traveled to Spain during July – October 2010, after the Catholic Church, working with the Cuban government, offered them freedom only if they left the island. Many of the passports of these political prisoners and even their families (minors) were stamped by the Cuban government with the words: “FINAL EXIT”. These political prisoners of conscience were never pardoned of the “crimes” they never committed nor have the unjust sentences imposed by Cuban tribunals been eliminated.